POS Tapes manufacture the top 5 products needed for all FSDU's and Dump Bins. Wobbler Arms – Are used to bring attention to your product, they are available in a range of shapes and sizes to make your product stand out. 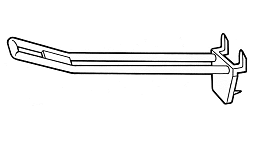 Merchandising Prongs – Available in doubles or singles in a wide range of lengths, for pricing or samples please do not hesitate to contact us. 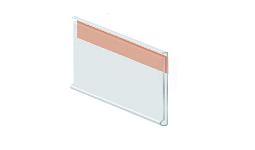 Corrugated Shelf Clips – Available in White or Black from stock, We also offer a large corr-a-clips to support much heavier products. 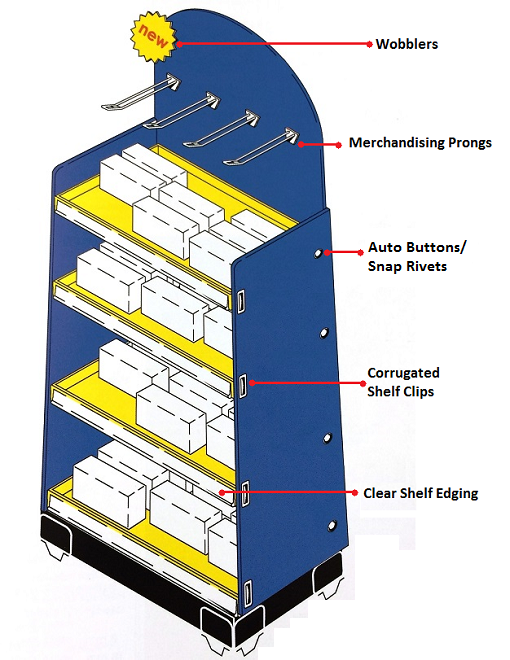 Automatic Buttons /Snap Rivets – These are an essential product for FSDU and dump bin manufacturers. Clear Ticket Holders – Available in a range of sizes and can be cut to length for orders. 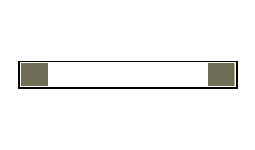 Our clear ticket holders have a strong self-adhesive tape backing to ensure easy fixing to the FSDU. Recent improvement on our Inject Moulding Line within production at POS Tapes allows us to make and hold large stocks of Corrugated Shelf Clips. This is due to high demand from our clients and steady growth within the company. 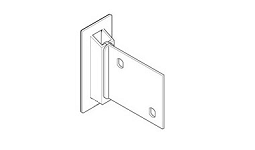 White, Black and Clear Corrugated Shelf Clips are immediately available and ready to use. Due to this improvement we are also able to pantone match required colours and have Corrugated Shelf Clips custom made. 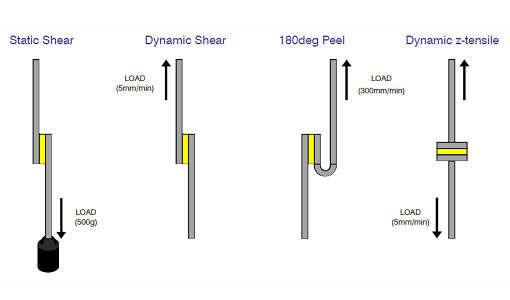 With being made in house this also allows for a low MOQ and quick lead time! Production Improvement on our Injection Moulding line. POS Tapes produce a number of Plastic injection moulded products for the Point of Sale Market. Due to high customer demand over the last 2-3 years and a successful exhibition at Euro Shop in Dusseldorf 2014, We have invested heavily into the production of our Corrugated Shelf Clips. Because of our improved production process this now allows us to produce an higher quantity and quality in our daily and weekly production runs, therefore improving our stock holding. 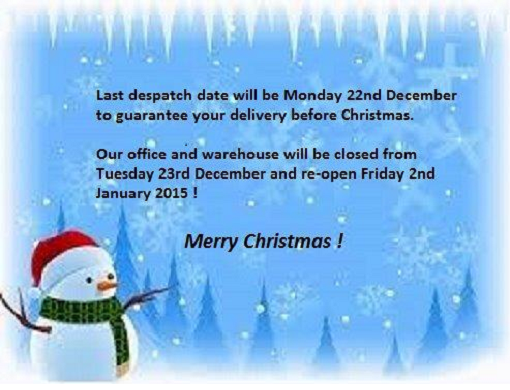 This will allow for next day delivery when needed and improve our service to a demanding market place. Taking all this into consideration we now offer an even more competitively priced Corrugated Shelf Clip for the Point Of Sale corrugated cardboard, free standing display units manufacturers across the World. 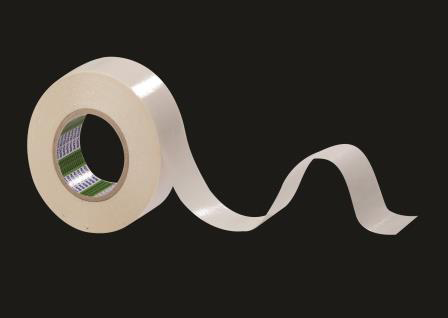 To become distributor for POS Tapes range of adhesives & plastic products across Europe, please contact matthew@postapes.co.uk or call 0191 2697810 for further information. 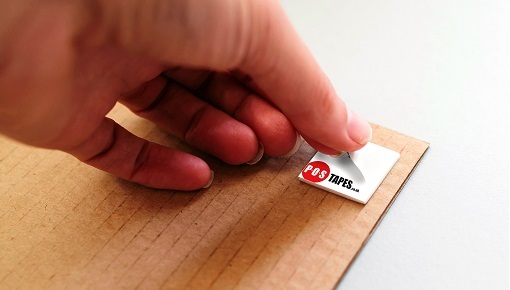 Here at POS Tapes we pride ourselves in all our products and our high quality of customer service. When a customer has a problem we do everything we can including designing and manufacturing new products to solve their display issues. Recently we were approached by a well-known high street retailer with over 400 store country wide with a problem they needed fixing. 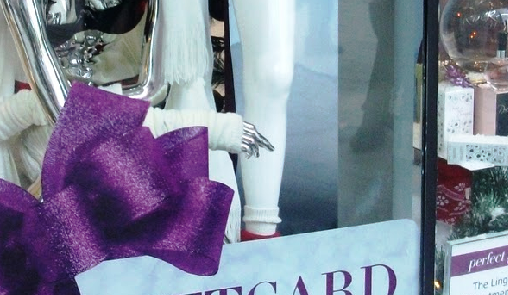 They had a specific request for a crystal clear removable product that would be able to stick heavy posters of 500g to the glass windows for their in-store displays for long periods of time and would also be able to withstand all types of weather changes. Collecting all their requirements the POS team had an internal discussion with our technical and manufacturing team to find a solution. In doing so we decided that we could use our 3257 removable ProLINK and transform this from a Pad of 22mm x 22mm x 0.5mm to rolls of 50mm x 10m as we manufacture those onsite. By doing so we were able to give our client a product that could accommodate for the weight requirements and was easier to handle in small roll form both for shipping and for their display teams. However the main reason in choosing the ProLINK 3257 over any other POS Product was the fact it is a removable product. The ProLINK 3257 will remove cleanly from the glass after 4 weeks in the window and it will remove from the poster without damaging, therefore saving them a lot of time and money on reprints. After our client tested the product for themselves we are proud to say this was a success and will be in-store for the Christmas displays. 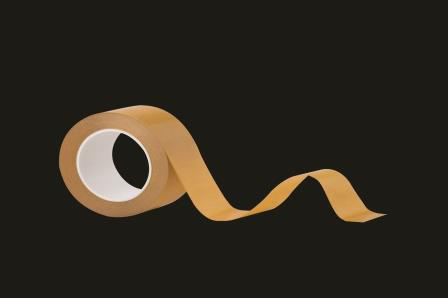 This is something that we are more than happy to do for any client here at POS Tapes, Should you require any bespoke adhesive solutions please do not hesitate to contact our team to discuss on sales@postapes.co.uk or 0191 2697810. 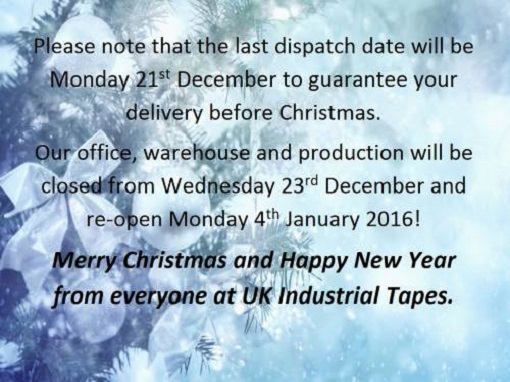 Call 0191 2697810 or email sales@postapes.co.uk during our opening hours.